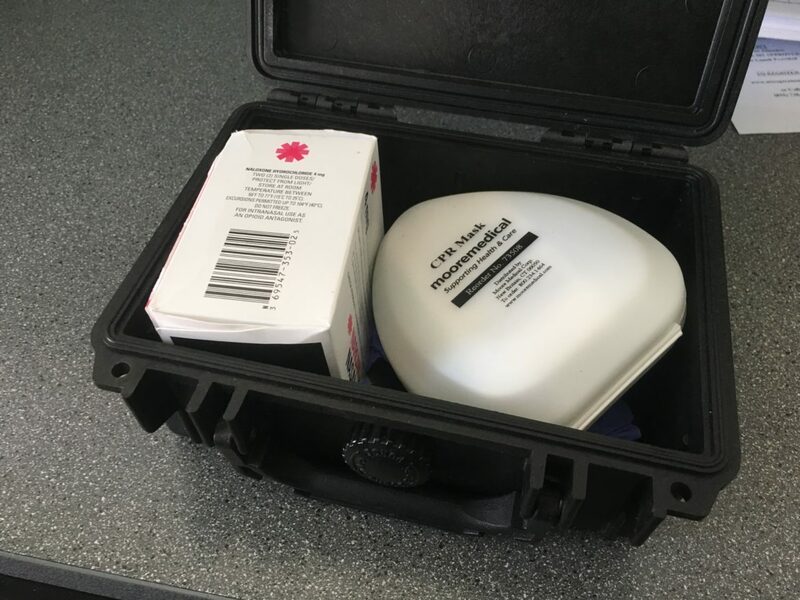 One of the pre-assembled Narcan kits provided to the Lansing Township Police Department. Narcan is a drug that counteracts the effects of opioid overdose and can be administered by first responders to save lives. Photo by Casey Harrison. When Matt Birr began his tenure at the Lansing Township Police Department over 10 years ago, he and his department seldom responded to calls of opiate- and opioid-related overdose calls. From the abuse of prescription medications like Vicodin or Oxycontin to hard street drugs like heroin, Birr — and officials all around the state — have seen staggering spikes in drug overdoses to the point where Gov. Rick Snyder has declared the issue an epidemic. 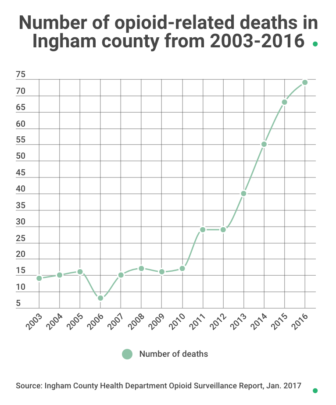 Opioid-related deaths in Ingham County have skyrocketed over the last 14 years and the trend is continuing to grow at an overwhelming pace for first responders to deal with. According to a January 2017 Opioid Surveillance report conducted by the Ingham County Health Department, opioid-related deaths have risen 925 percent since 2006. There were 74 total opioid-related deaths in Ingham County alone in 2016, an all-time high. Birr said the department, which also responds to calls in other municipal jurisdictions, can respond to one heroin-related overdose a day. Sometimes more. The number of opioid-related deaths in Ingham county from 2003-2016. Data source from the Ingham County Health Department. Graphic by Casey Harrison. Birr said he thinks the spike in heroin overdoses can be attributed to new, more potent opioids are mixed in with heroin batches. Last September, the Michigan Department of Health and Human Services, or MDHHS, and the Michigan State Police warned residents carfentanil has been circulating within the state. According to a press release by the MDHHS, carfentanil is 10,000 times more potent than morphine and 100 times more potent than fentanyl — a drug that the Centers for Disease Control and Prevention claims is 100 times stronger than heroin. The MDHHS claims carfentanil is used to tranquilize large animals and is not approved for human consumption because of its potency. When these drugs are mixed together, or combined with prescription painkillers, the result can have adverse health effects. Even after one try. “These can also result in mixtures or cocktails of drugs, many of which can be highly addictive or highly fatal with just one overdose,” said Phillip Schertzing, instructor and director of MSU Global Community Security Institute in School of Criminal Justice. Lansing Township Police Chief Adam Kline believes it’s too easy for many people to get their hands on these drugs. And it starts with prescription abuse. Birr says carfentanil is actually cheaper to produce than heroin, and are easier to smuggle, making it more attractive to drug dealers and cartels because it ups the potency while affecting the total volume sold — which can appeal to addicts. Furthermore, Birr says the market for heroin has been flooded since the Taliban left Afghanistan. According to Birr, the Taliban prohibited the growth of poppy seeds and opium, key components to making heroin. To combat fatal overdoses, Kline said officers are equipped with Narcan kits. Narcan is a drug that acts as an antidote that reverses the effects of many heroin and opioid-related overdoses if it is administered quickly enough. According to Kline, most of the funding for Narcan kits come from private donations, which are always appreciated by the department. Lansing Township was one of the highest regions for Narcan doses in Ingham county last year. 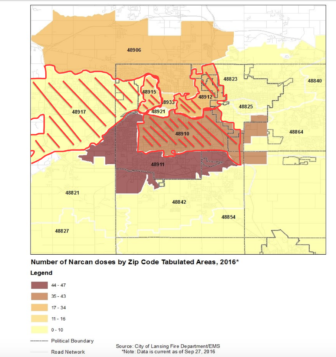 Map of Ingham county and the postal codes where the highest frequency of where Narcan was administered in 2016. Data and map from the Ingham county health department. Illustration by Casey Harrison. According to Schertzing, Narcan is a medical breakthrough and is needed in almost every law enforcement vehicle. In 2015, officers administered Narcan in 242 incidences and 255 in 2016. According to the Opioid Surveillance Report from the county, those numbers are expected to rise in 2017. 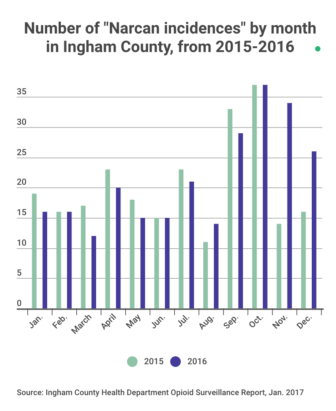 Number of Narcan incidences in Ingham county from 2015 and 2016. Data provided by the Ingham County Health Department. Graphic by Casey Harrison. One of the biggest issues first responders face when addressing emergency overdose situations is the lack of resources provided to them. As the epidemic proves to be more rampant, police officers are required to administer more Narcan with a higher sense of urgency. Kline said he thinks the problem runs deeper than that as well. From personnel costs to treatment and facility fees, everybody involved with the response and rehabilitation process need help in order to effectively fight the epidemic that is quickly running rampant. 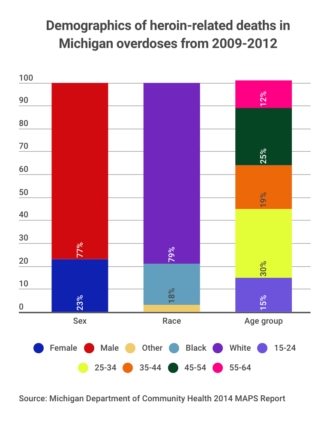 Demographics of heroin-related deaths from 2009-2012 in Michigan. Data source by Michigan Department of Community Health 2014 MAPS Report. Graphic by Casey Harrison. 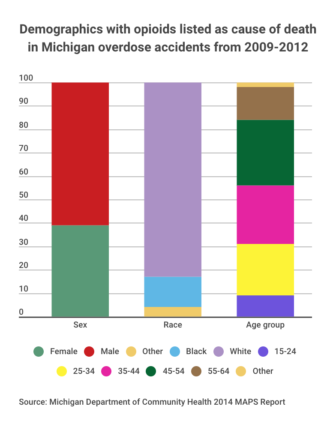 Demographics of opioid-related deaths from 2009-2012 in Michigan. Data source by Michigan Department of Community Health 2014 MAPS Report. Graphic by Casey Harrison. Ingham County officials are also well aware of the burden it poses on everybody involved to help save lives. Last January, notable members of Ingham County municipalities, most notably Lansing mayor Virg Bernero and Ingham County Health Officer Linda S. Vail, helped establish the Ingham County Opioid Work Group to increase understanding of the epidemic across the county. The new legislation will hold tighter restrictions for physicians and impose disciplinary action if the prescriber is not obtaining reports from MAPS and increase penalties for physicians and pharmacists who wrongfully prescribe, dispense, manufacture or distribute controlled opioids. 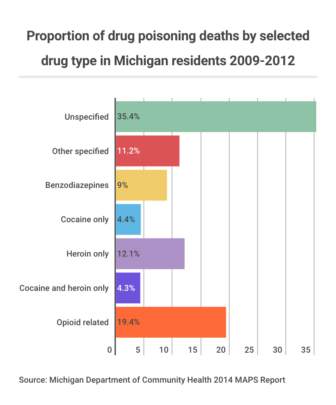 A graphic depicting the proportion of drug poisoning deaths by drug type in Michigan from 2009-2012. Graphic by Casey Harrison. Schertzing said he believes the new regulations are long overdue because he believes the abuse of prescription opioids are usually the gateway to harder drugs on the street. With the new rules in place, it can be harder to develop an addiction to painkillers if physicians and pharmacists are held to higher standards. Statistics from MAPS can prove Schertzing’s claim. 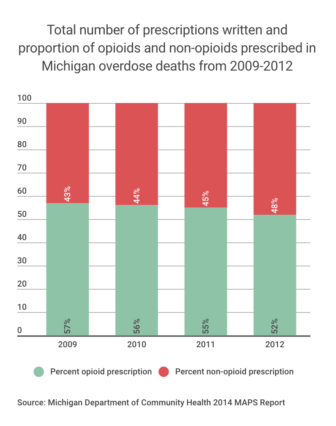 Opioids have accounted for over half of the total prescription drug-related overdose deaths in Michigan since 2012. Among all drug poisoning deaths in the state from 2009-2012, opioid overdose was the second-leading cause of death and accounted for 19.4 percent of deaths. Heroin followed suit and was responsible for over 12 percent of drug-related deaths. The total number of prescriptions written and proportions of opioids and non-opioids prescribed in recent Michigan overdose deaths. Graphic by Casey Harrison. But the problem this epidemic is causing stems far more than just a Michigan issue. The CDC suggests that in 2015 Michigan was one of 19 states across the country to see a significant rise in drug overdose deaths from the previous year. For Lansing Township and the state, there is more work to be done before the epidemic is solved.